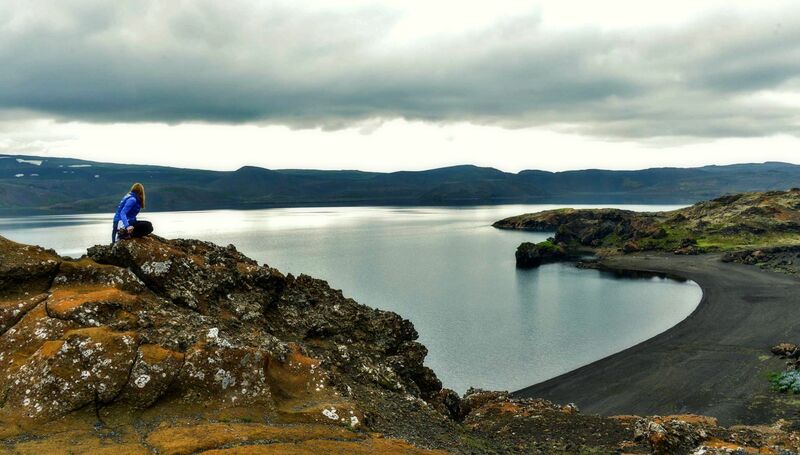 Excited for my scenic tour along the Reykjanes Peninsula, I packed my swimsuit and dressed in layers for a beautiful drive through lava fields toward Kleifarvatn, a glacier produced clean, translucent rich blue lake surrounded by red and brown flat hilltops and mountains lined with black sand beaches. It’s an area known as “Volcano Park” due to the volcanic and seismic activity in the area. With the sun shinning, the air crisp and refreshing, Jón and I saved my most anticipated spots for the end of my journey. 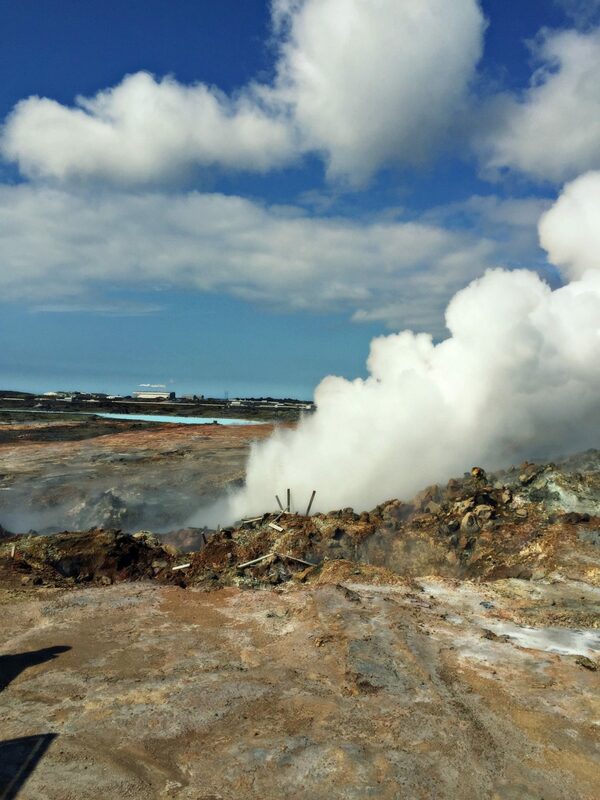 Upon my arrival in Iceland, I was greeted by a strange smell. Was it fish or well water or was I being poisoned? The answer is simple: sulfur. The country smells like sulfur due to the geothermal origins of hot water. There is nothing wrong with the water or the air quality. In fact, Iceland is one of the world’s greenest countries and the drinking water contains no metals or chlorine. Fill up your empty water bottle and drink away. Plan to hold your nose from time to time and learn to grin and bear it. 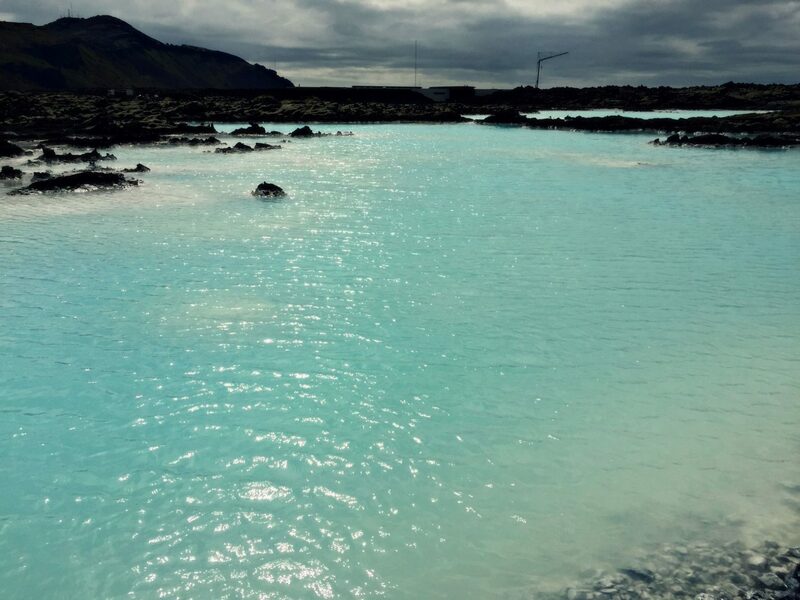 The same “salty” aroma greeted me at the Blue Lagoon, one of the 25 Wonders of the World. Formed in 1976, the lagoon is man-made and fed by water from a nearby geothermal power plant. Rich in minerals like silica and sulfur, locals purport the lagoon heals skin ailments like psoriasis. I prayed for sun and Mother Nature delivered. Since my sensitive skin needed a little tender care, I braved the commercialization and the loads of tourists for an afternoon of enjoyment. After a required initial shower, I purchased a waterproof case for my IPhone *must have proof I was there* and scrutinized my fellow tourists. There were groups of senior citizens, families, couples, college girls, macho men, dreaded teens and me! We floated and waded through the special waters of the Blue Lagoon together as friends. Removing my flip flops and hanging my towel on the outside racks, I moved cautiously down a slope deeper into the milky aquamarine waters of the lagoon until the water covered my shoulders. Black volcanic rock encircled the lagoon making the color of the water much more vibrant. The outside temperature reached approximately 60 °F, while the lagoon temperatures climbed hotter than an average hot tub in the United States. 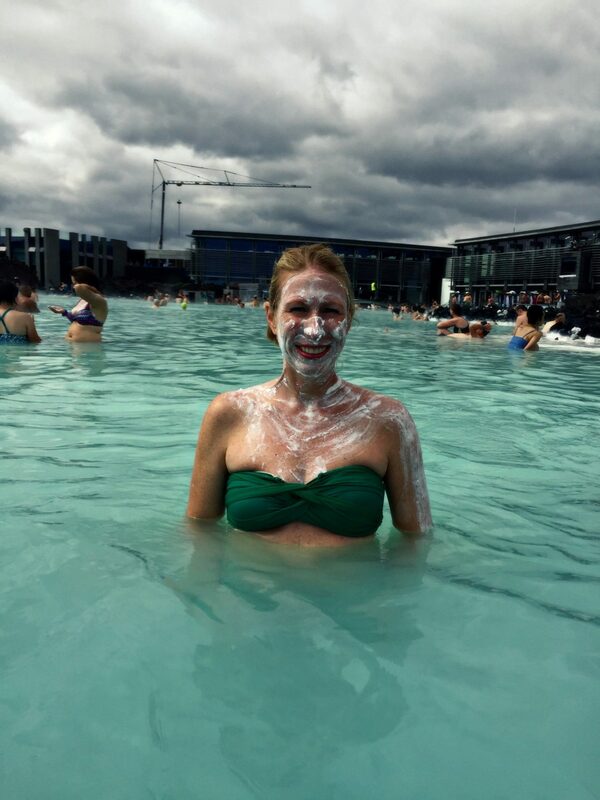 I bounced around the lagoon from one side to the other testing out the hotter geothermal areas and lounging on a deck to apply a mud mask. I asked the college girls to take a photo for Facebook evidence and I dunked my face under the cloudy water to explore the healing capacities of the lagoon. Despite a pool full of strangers, I discovered a secluded spot along the far wall of rocks and relaxed as the waters worked their magic and pealed away layers of time, stress and worry. It’s hard to believe 6 million liters or 1.5 gallons of geothermal seawater replenish the lagoon every 40 hours. It’s mesmerizing. Somehow I wish the secret of the soak, remained a secret. After feeling rejuvenated and appropriately soaked in salt, my guide Jón and I headed to the bridge between Europe and North America. 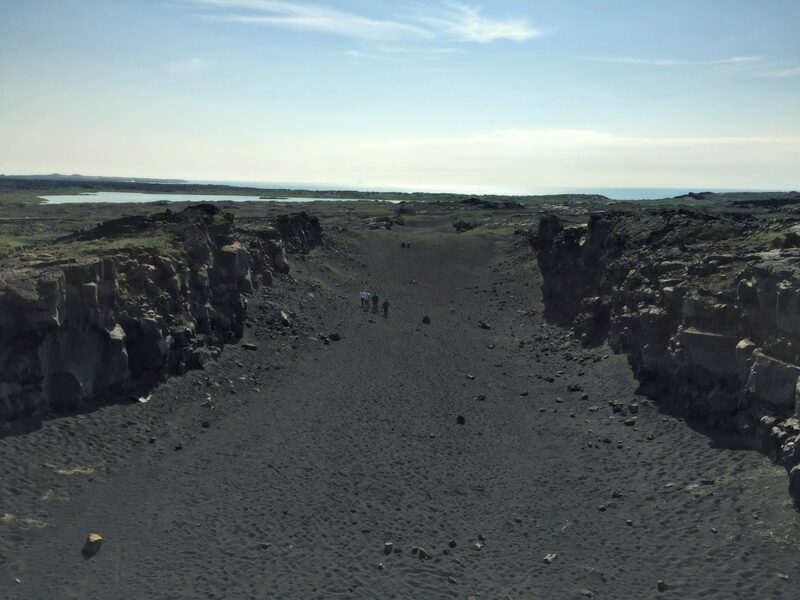 I know it’s a bit of an overstatement to say I straddled the continents but technically I did stand where a canyon was created due to the movement of the tectonic plates or the Mid Atlantic Ridge. According to the continental drift theory, the Eurasian and North American tectonic plates are continuously moving apart (about 2 cm a year) with great pressure under the gaping rifts. As the plates drift, fissures form due to stresses created by the tension that builds up as the plates move further from each other. Nearby, we visited Gunnuhver or ghost, Iceland’s largest mud baths. Bubbling pools of scorching grayish mud explode from the earth creating patches of dense steam shooting high into the sky. It smells here too and the steam should be avoided, as it’s dangerous if standing too close. The geothermal area is fascinating to see first-hand because it’s difficult to imagine the ground creating that much heat and pressure. The landscape is also very lush and green in the area because the hot steam melts the snowfall. Miles of lava rock, snow drenched mountains and volcanoes, the Atlantic Ocean, fishing, electricity, tourism, inclement weather and hardy people together make Iceland what it is today. I need not strain my imagination to consider the possibilities of a strong Icelandic economy. It includes fishing in the cold Atlantic waters, geothermal and hydroelectric power and guests from around the world spending money in restaurants, stores and exploring and trekking the stunning scenery the country offers. Fishing comprises approximately half of the country’s total exports and employs seven percent of the work force. 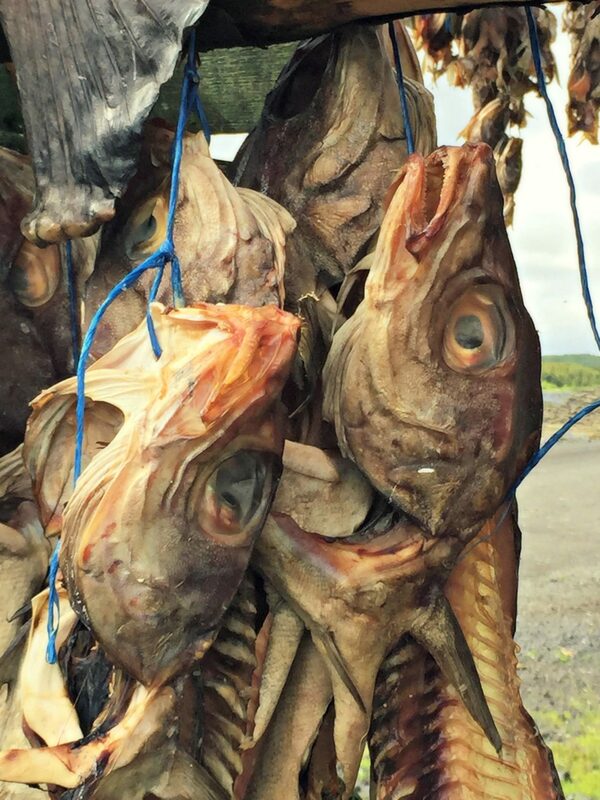 Think of all the cod, shrimp and salmon on dinner plates and dried cod sent around the world. Americans left behind cement and the BBQ after World War II and Starbucks hasn’t landed here because locals expect their second cup of java free. McDonald’s pulled out in 2008 during the economic crash. That’s fine with locals. Icelanders are resilient people with a strong sense of tradition and family and whether it’s nature’s beauty or its beast, they are ready for it. Energy: The country expects to be energy-independent by 2050. Government: Iceland is a democracy and a parliamentary republic. The president of Iceland is a ceremonial head of state and serves as a diplomat but has veto power over parliament. He or she is elected for four years, with no term limit. The head of government is the prime minister. Women: Iceland was the first country in the world to have a political party formed and led entirely by women. It elected Vigdís Finnbogadóttir to president in 1980. She was the first woman in the world to be elected head of state in a national election. Women received the right to vote in 1915, five years before the U.S. Iceland became the first country in the world to grant equal rights to men and women in 1850. In 2009, Iceland elected he world’s first openly gay head of state and their first female Prime Minister. Flag: The Icelandic flag is blue with a red cross outlined in white. The colors represents the three elements of the island: red for volcanic fires, white for snow and glaciers and blue for the skies above. Population: 329,100 (Jan 2015). An estimated 7% (23.000) of the population is of foreign-born nationality. Median age is 37,1 years. Size: 103,000 sq. km (40,000 sq. miles), bigger than Hungary and Portugal and a little bit smaller than Cuba. Language: The official language of Iceland is Icelandic, a North Germanic language derived from Old Norse. It has changed relatively little throughout the centuries. Religion: Most Icelanders (80%) are members of the Lutheran State Church. Another 5% are registered in other Christian denominations, including the Free Church of Iceland and the Roman Catholic Church. Almost 5% of people practice ásatrú, the traditional Norse religion. Economy: GDP = $14,5 billion. Unemployment rate: 5%. Animals: Arctic Fox is only animal native to Iceland but sheep, horses, rats, mice and birds now roam its shores. Beer: It was not available until 1986. Blame the French and their wine. Christmas: Icelanders celebrate on December 24. People work until 3pm or 4pm in the afternoon and then have a big family dinner.